Making a good margin on your maintenance work is vital to the success of a lawn maintenance business. If you’re consistently underbidding projects, you’re losing money on the work that you and your crews are performing. And on the other hand, if you’re overbidding work, you’re company is going to price itself out of jobs. It can be difficult to get an accurate estimate for your work every time. If you mainly work with residential clients, customer’s yards can vary vastly, even if they have a similar square footage of property to mow and maintain. Trees, landscape, walkways, fences, pools and ponds can all complicate things. If you’re working with commercial properties, property managers will likely receive multiple quotes for the work that needs to be performed, so you need to be competitive with your pricing while still ensuring that you can turn a profit. There are green industry professionals that are able to create an estimate for work seemingly off the top of their heads. They might feel comfortable seeing a property, know their costs well enough and can estimate the total man-hours that would go into the job. That method isn’t always an option and it becomes increasingly difficult when there are obstacles throughout a property and even things such as hills can add difficulty to the work, all reducing the bottom line. Estimating your lawn maintenance work accurately is one of the main components of operating a profitable business. And with the help of technology, you can make sure that you’re creating the most accurate estimates that yield a larger bottom line. 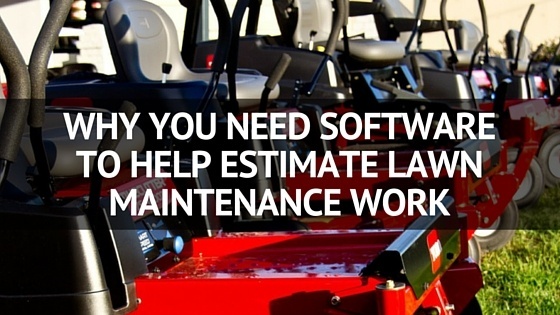 Here are three reasons why lawn maintenance businesses need software to assist with estimating. Just taking a look at a property and coming up with a “guesstimate” is going to cause issues for you and your business. Using software to help generate an estimate will ensure that you’re crossing your T’s and dotting your I’s on your estimates. You’ll have to go through fields that are both standard and fields that you and your sales people will come up with to put together accurate quotes. Since most lawn maintenance estimating software programs will be tied in tightly with your daily operations, you know what your costs are for your work. You know what your hourly rate is per job, you know how long it would take a crew to accomplish the work a prospect needs done and you can determine whether or not you can make a profit on that work. The more estimates that you create using software, the easier it is to generate quotes for new prospects. You’re able to use the historical information that you collect from each job to you future advantage. Instead of just doing a walk through of a property and coming up with a quote off the top of your head, you can use your data and come up with an accurate quote for the work based off of hard numbers. It might be difficult for your customers to have a good grasp of your actual costs involved in lawn maintenance services. Using software can help you generate an estimate of your costs in a detailed manner. You’re able to give a detailed list of what your costs are and explain to your prospects why you charge what you do. When they have the ability to follow your costs, line by line, they are able to understand what it takes to maintain their property. Want to learn more about how lawn maintenance software improves your business? Sign up below to learn more about FieldCentral - the easiest way to take control of your lawn maintenance business.